This post contains affiliate links, so if you use them to make purchases, you won't pay any more but I might receive a small commission that helps me keep the blog running. Thanks for your support! On paleo, meat every meal, every snack - it gets a bit much. Especially for people who came to AIP or paleo from a vegetarian or vegan diet, like I did. Meat is nutrient dense, I agree - but sometimes I just need a break. So nowadays I eat more fish. Salmon or trout is my first choice, mostly because the girls like it and eat it up without any complaints. But also, it's full of those handy omega 3 fats that are supposed to reduce inflammation and look after our brains. All good. And this is a really easy way to cook salmon. I roast it on top of parsnip chunks, which, depending on how long you cook them, turn into the best roast potato substitute ever. A quick sprinkle with spring onions and some dill and you've got a gorgeous base for an effortless fish dinner. And I only just learned what gremolata is. I thought it was a type of granita (get me) but it's actually chopped up parsley, lemon and garlic to make a herby condiment you can scatter over meats. I just added dill, because - as Jamie Oliver would say - dill and salmon are best friends. And parsnips are part of the love/friendship triangle too, let me tell you. 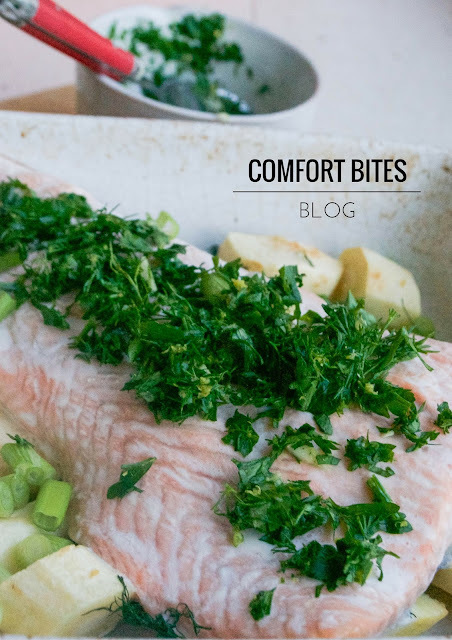 Cook this for a bit longer and the parsnips will turn roastier and the salmon with be sizzling with a more burnished colour. It's all down to what you feel like. I was hooked on parsnips with salmon by the way, because of the Salmon Hash recipe from The Healing Kitchen book. The recipe states to mix up salmon with white sweet potatoes but I didn't have any. So I followed the suggestion to use parsnips instead. And my goodness. It's SO GOOD. First, melt the fat in a roasting dish and slide into an oven preheated to 200ºC/gas mark 6/400ºF. After a minute, take it out and add the parsnip chunks, stirring it gently so they're all coated in the fat. Tear off some of the fresh dill leaves and stir these into the parsnips, along with a pinch of salt. Place it back in the oven to roast for 20 minutes. After the 20 minutes are up, and the parsnips have had a good head-start on cooking, take the half side of salmon and lay it gently over the parsnips. Return to the oven for another 20 minutes, or until the parsnips are cooked through and tender and the salmon is cooked thoroughly. If it needs a bit more time, put it back in the oven for a few more minutes. While the salmon and parsnips are cooking, make the gremolata. Chop the parsley and the rest of the dill and place in a bowl. Add the grated zest of the lemon and peel and chop the garlic clove. Stir everything together and put to one side. 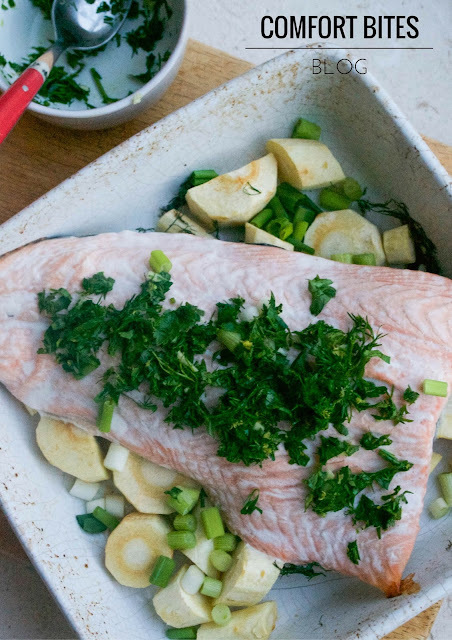 Once the salmon and parsnips are cooked, take the dish out of the oven and throw in the chopped spring onions. They should start to wilt and soften in the heat of the other ingredients. If you want them cooked a bit more, just sprinkle them in in the last 5 minutes or so of cooking. Serve the salmon with the dill gremolata spooned over and the roasted parsnips and spring onions underneath.